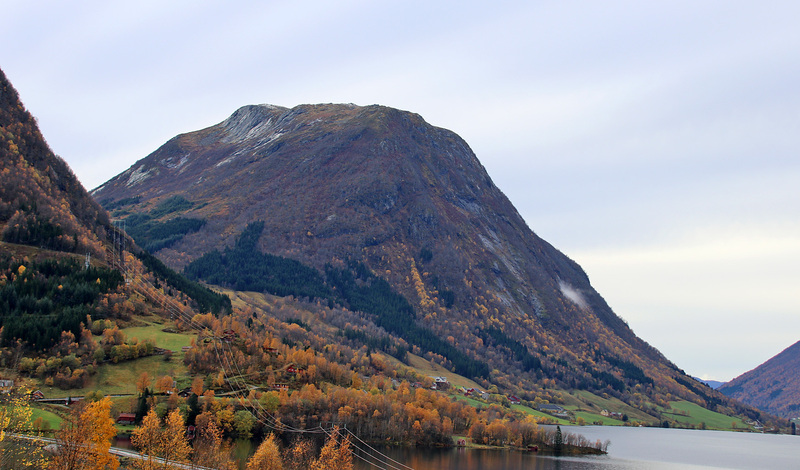 Monday: After spending the weekend with Anne in Sogndal, I began my journey home after work. The weather was nice and I stopped a few times for pictures. 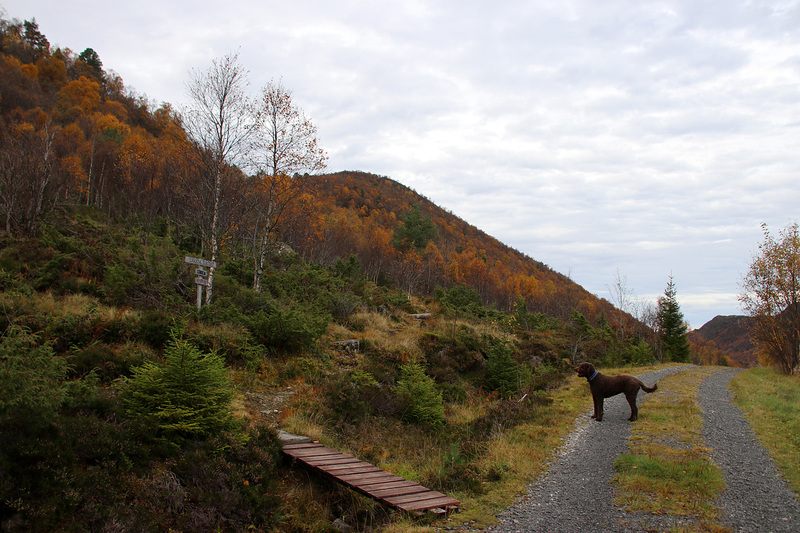 At some point, I had to walk the dog and figured that Orkja by lake Jølstravatnet would be a perfect place. 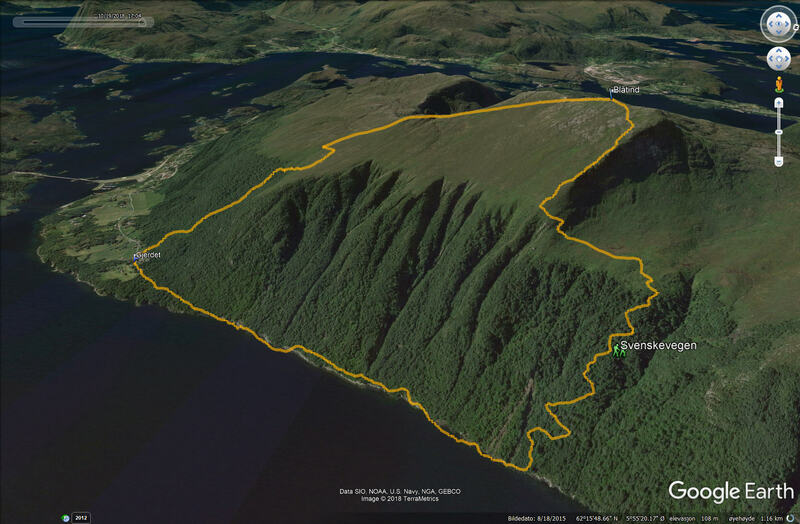 I chose the route Anne and I did back in 2012, although I suspected that wasn’t the normal trail. 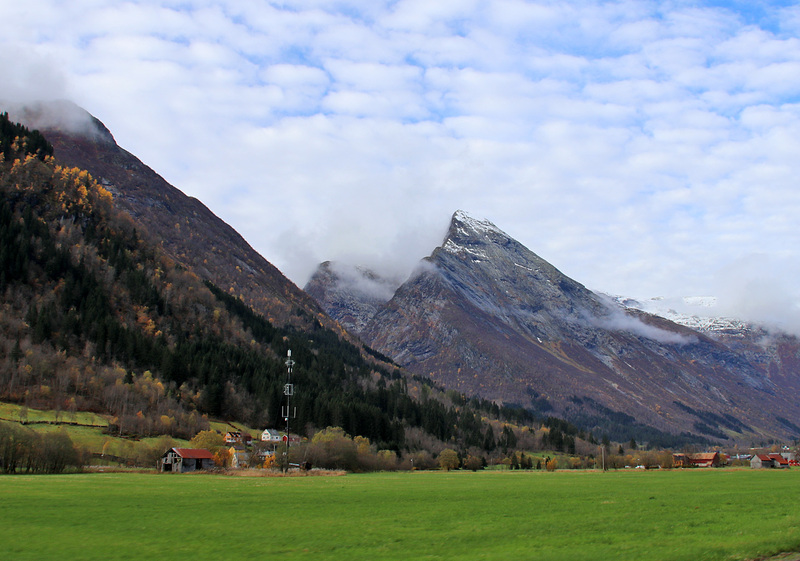 On my way up the Dvergsdalsdalen valley, I looked out for signposts, but didn’t see any. Clumsy me. 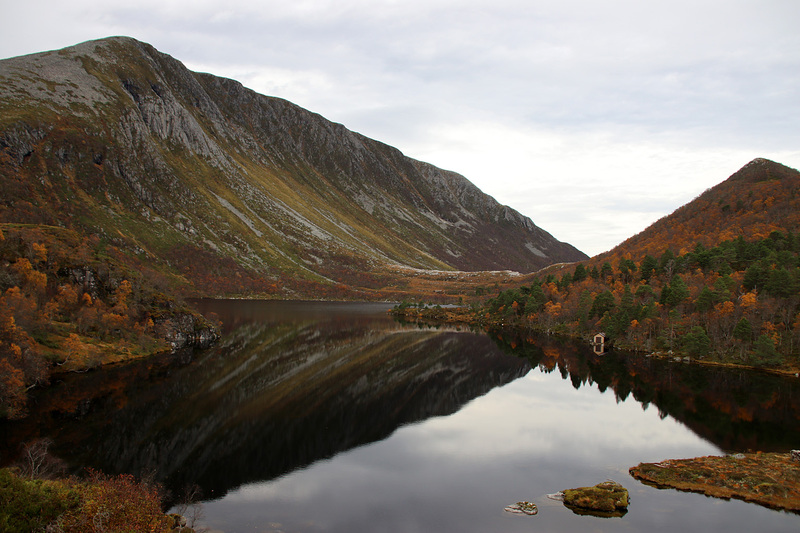 It was there, and I saw it when I drove down the valley, after the hike. 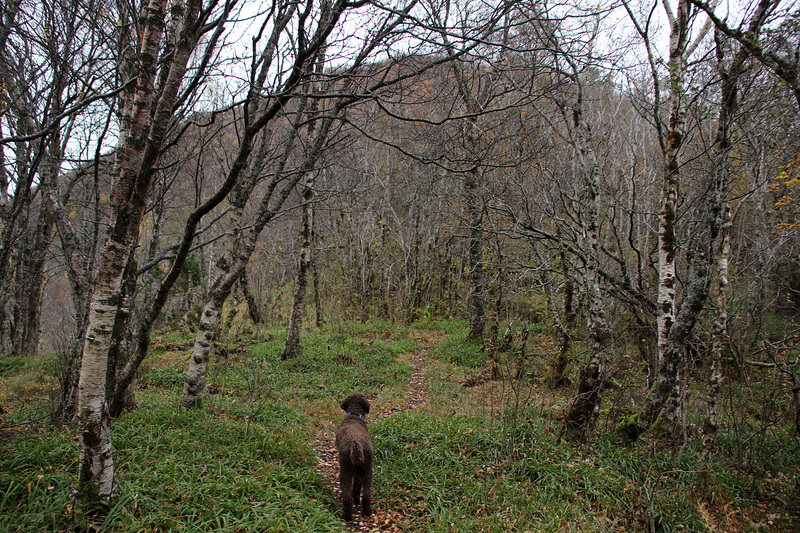 After locating the same place we started out from in 2012, Karma and I followed the path up the forest. The path was visible, but clearly not frequently traveled. 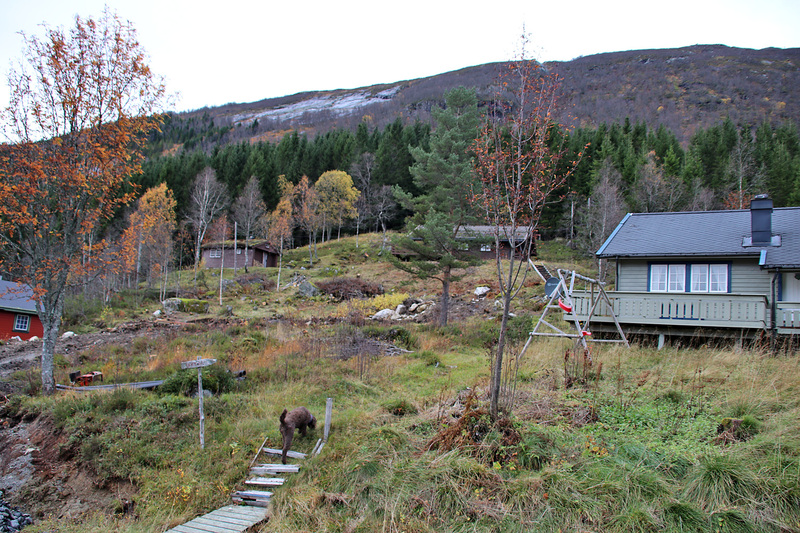 Eventually, we rose above the forest part and when we reached the mountain plateau, Orkja was 0,8km to the northeast. 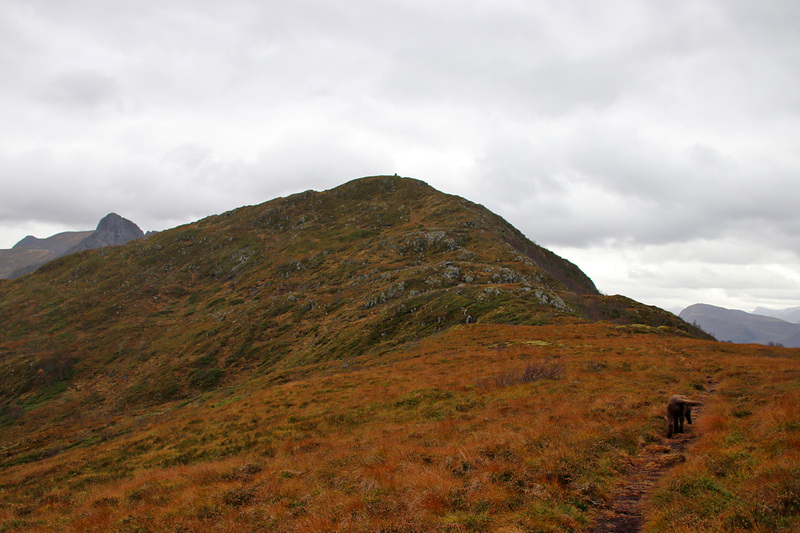 The path wasn’t very visible on the plateau, but no path was needed anyway. 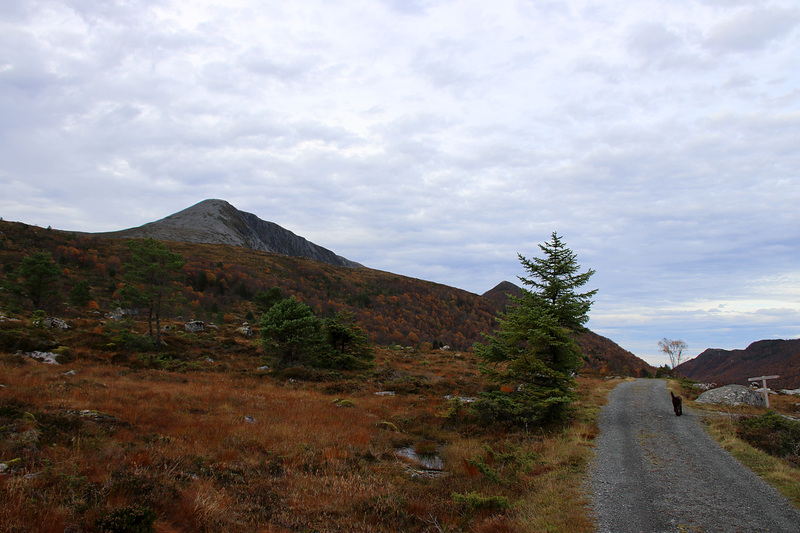 The summit offers a nice view towards the village Skei, in addition to numerous mountains in all directions. As I wanted to get back home before it got too late, we jogged down the mountain and returned to the car 1h:18m after leaving it. 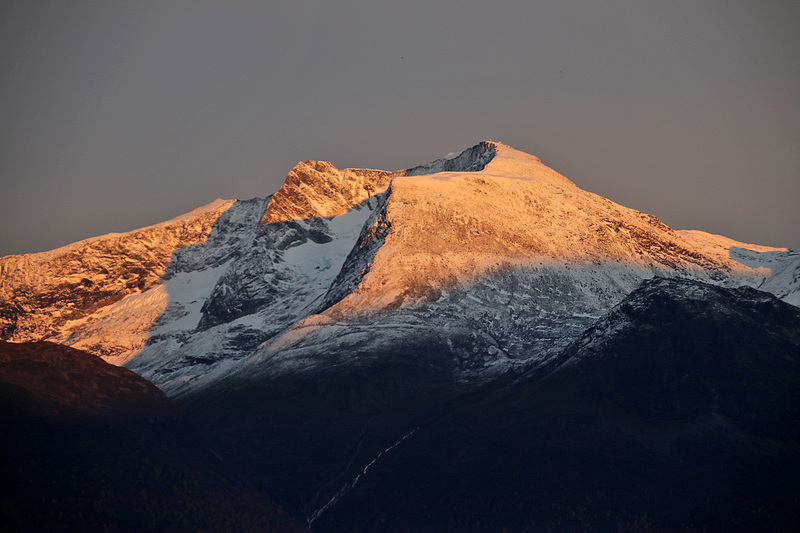 I passed the Olden village before the last rays of sunshine disappeared from the Skåla mountain. 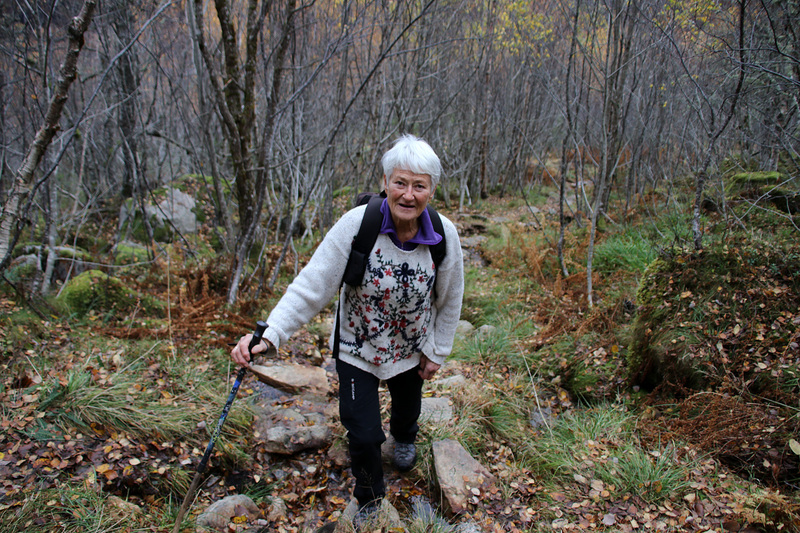 Skåla – I’ve run up this mountain. 1850 vertical meters. 1h:41m. Tuesday: Ålesund day, and after work I drove to Haram to visit Hildrehesten (the Hildre Horse) – a mountain I’ve been to several times during my years in Ålesund. But this would be Karma’s first visit. 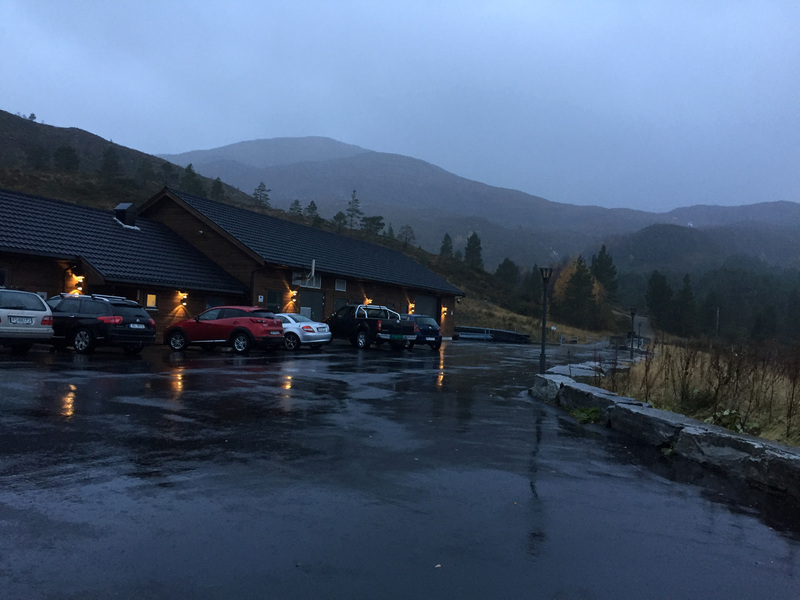 We drove to Gjerset, where I parked the car. 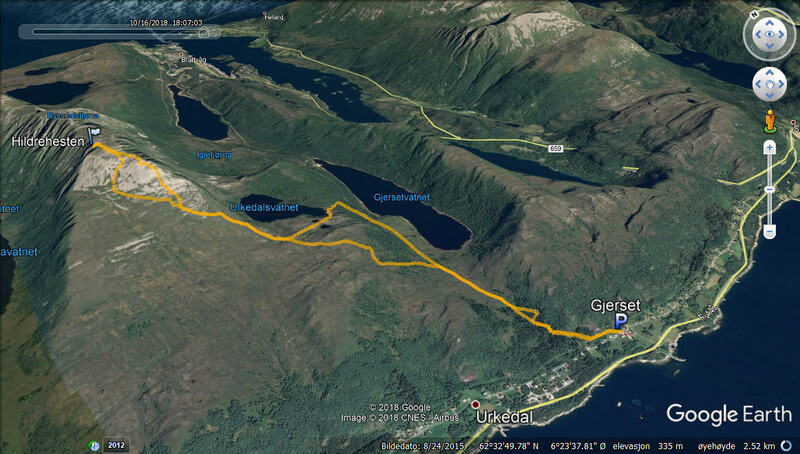 Then followed a 2km walk up the forest road until it was time to turn left by the Urkedalsvatnet/Tinden/Hesten signpost. 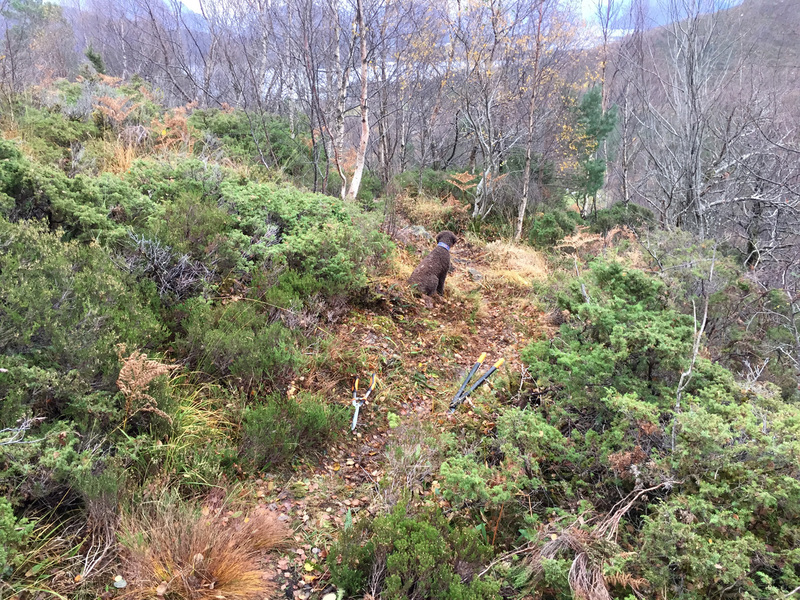 On my way up the forest, I met a woman who told me that she had done the majority of trail marking in this area. 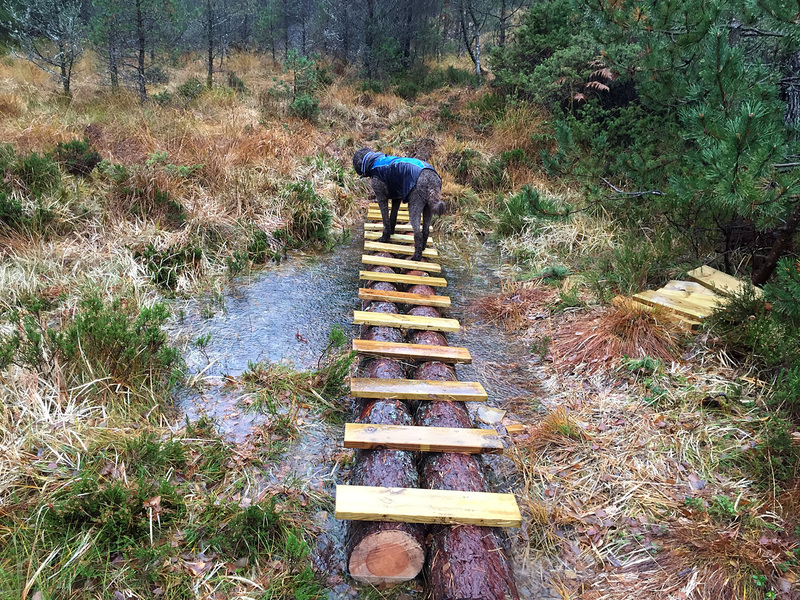 We talked a bit about voluntary work on trails (as I’m also in that game) before we parted. It’s been many years since I was up here, and it was really nice to be back! 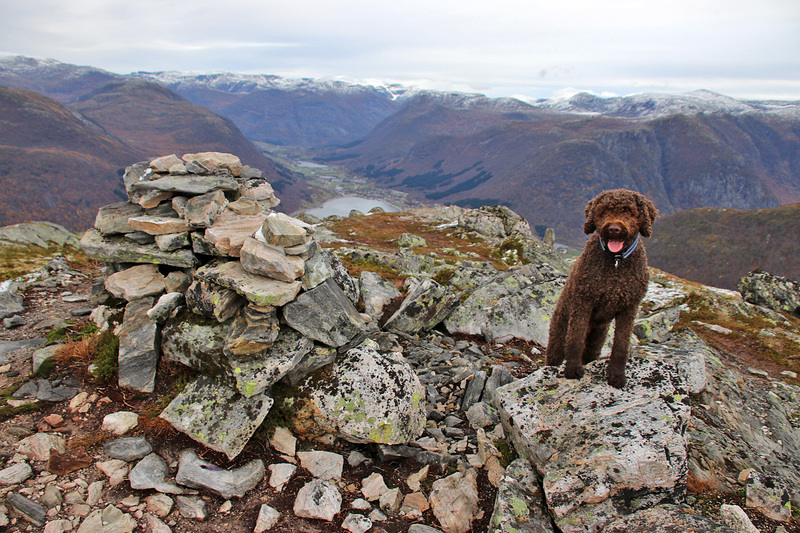 We reached the top, Karma received a treat, I enjoyed the view and took pictures. And then we turned around. I didn’t follow the path down from the top, but instead went off-trail in the massive boulder area below the top. That was a mistake, as it didn’t save me any time. On the contrary. Why did we go this way??? 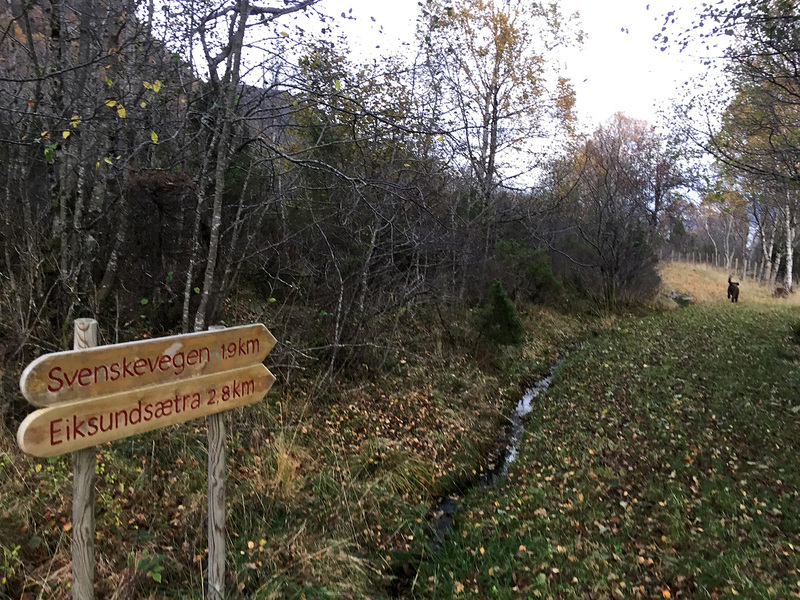 When it was time to turn left towards lake Urkedalsvatnet, I continued straight ahead and found a path across Gamletorvet, which took us to the end of lake Gjersetvatnet. From here, we followed the forest road back to the trailhead. Wednesday: Another work session in the Huldrehornet forest. Some progress, day by day. It was nice to see this overgrown path turn into an autostrada, little by little. Thursday: Bad weather day! On such days, Rjåhornet from Stemmedalen is a good alternative, because if the rain showers get too bad, there are a few places we can seek shelter. Including the two Tussa buildings on top. 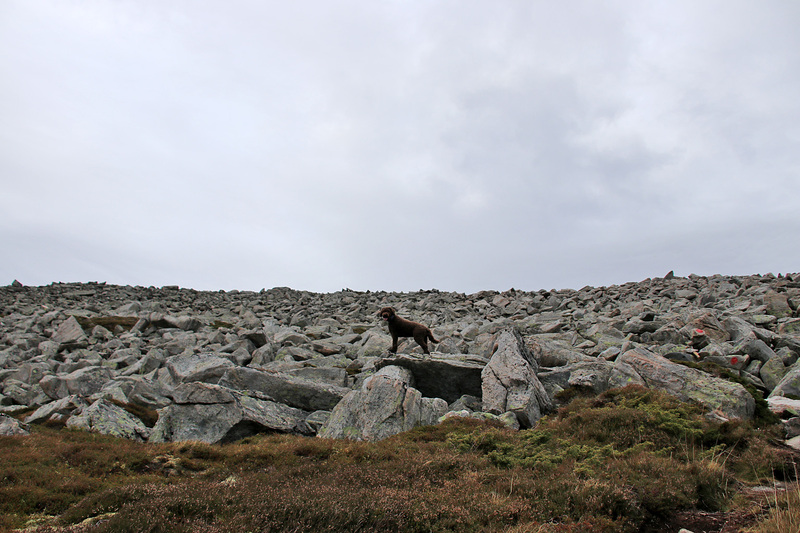 The weather didn’t invite for creative round trip alternatives, so we hurried down the way we came up. 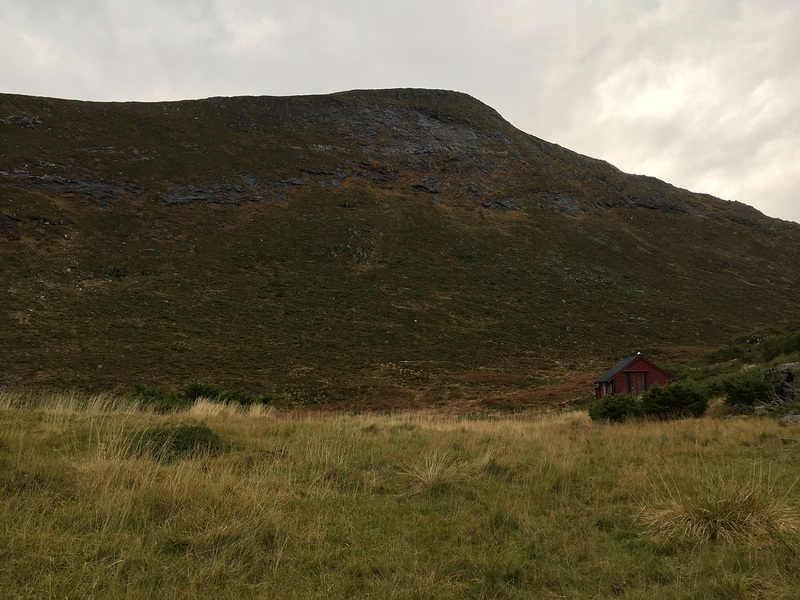 Friday: It’s been a while since I hiked Blåtind (the highest point on Hareidlandet island) via the Svenskevegen path, and so that was exactly what a planned to do this Friday afternoon. 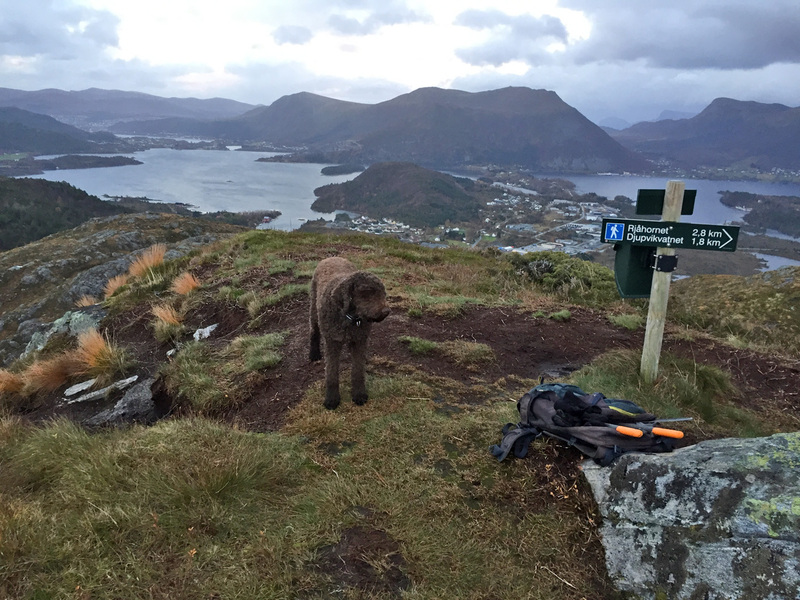 The starting point is Gjerdet (near Eiksund) and when Karma recognized the trip, she took off like a rocket. Blåtind = smell of hare. Not that I ever let her out of my sight so she can go hunting, but you can’t take the dream away from her. 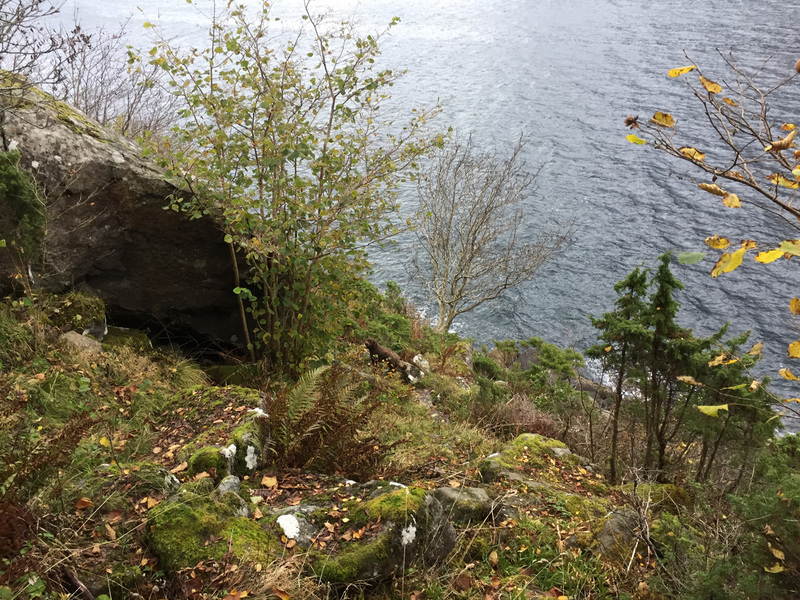 Then followed a 1,9km hike along the fjord – up, down, up, down. It looks like a flat curve on the total track, but there are some vertical meters involved. 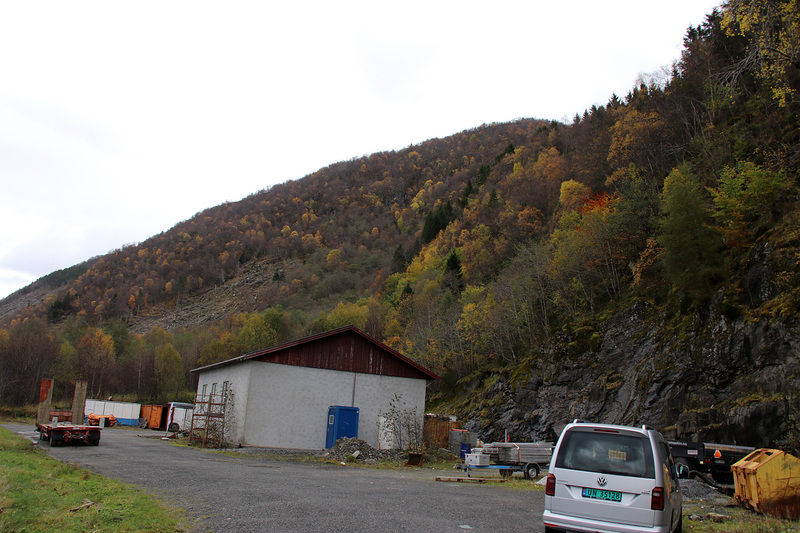 Then follows a steep 400 vertical meter ascent up to Eiksundsætra. 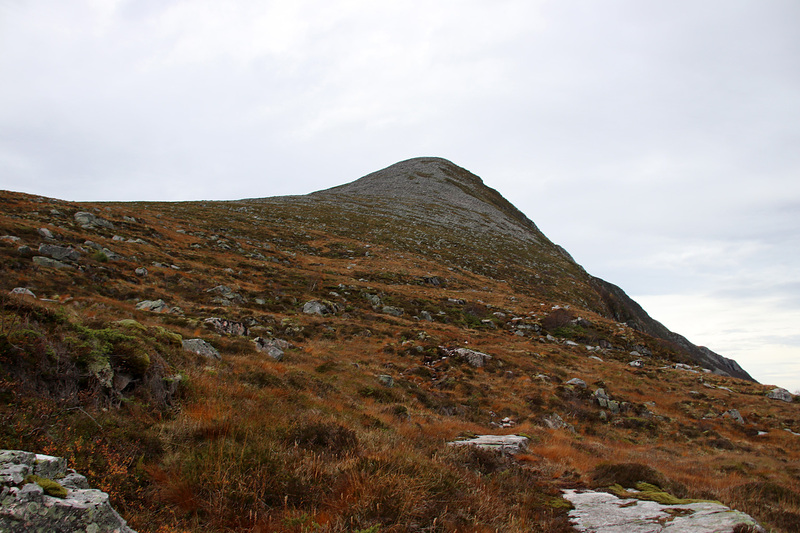 Eventually, we reached the top and enjoyed a short stay on top before we moved on. 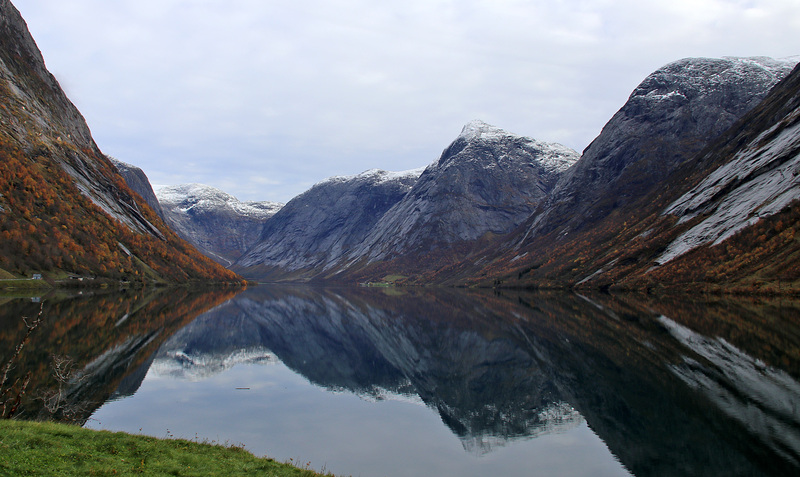 We then went down to Grøthornet, and then took a direct route down to Gjerdet. The first time I did this route, I was able to follow the vague path all the way, but I have not been able to repeat it since then. The worst part is the upper juniper bush. 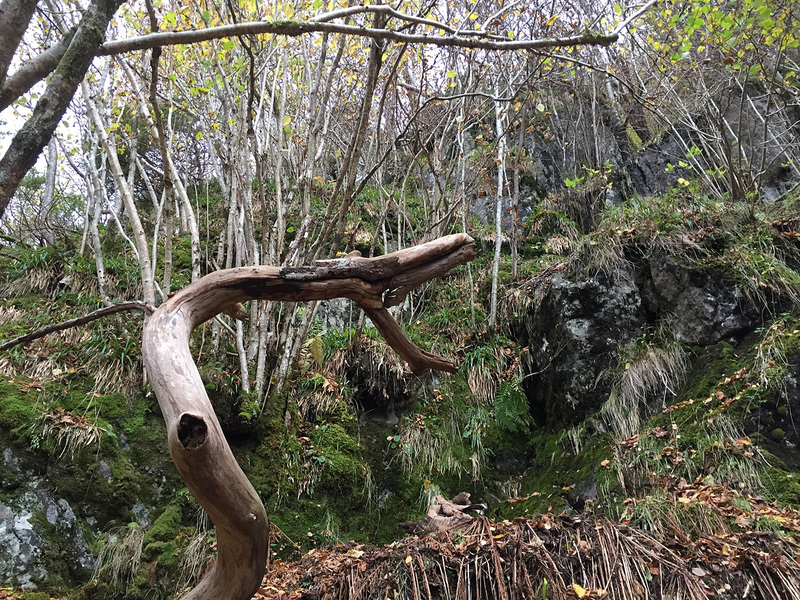 Once in the birch forest, you can go any which way you please. 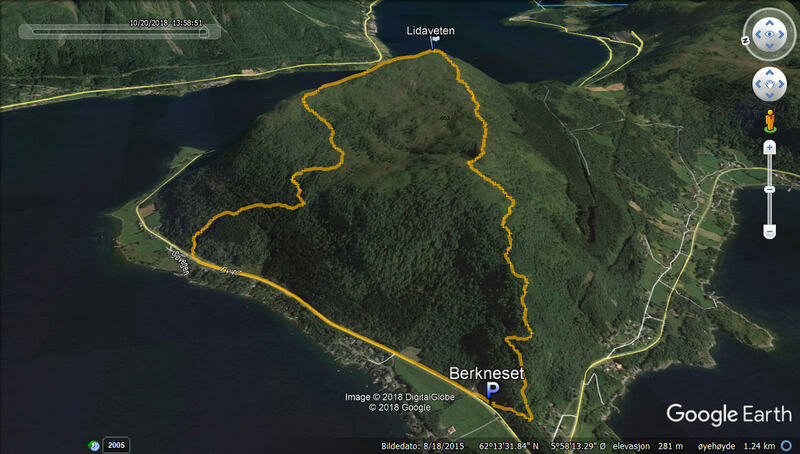 Saturday: I drove to Berkneset – to try out a brand new route (to me) to Lidaveten. This route runs up the northwest ridge, and I had heard good things about this route. So, I looked forward to it. I parked by Berknes Maskin and found the “Lidaveten” signpost. 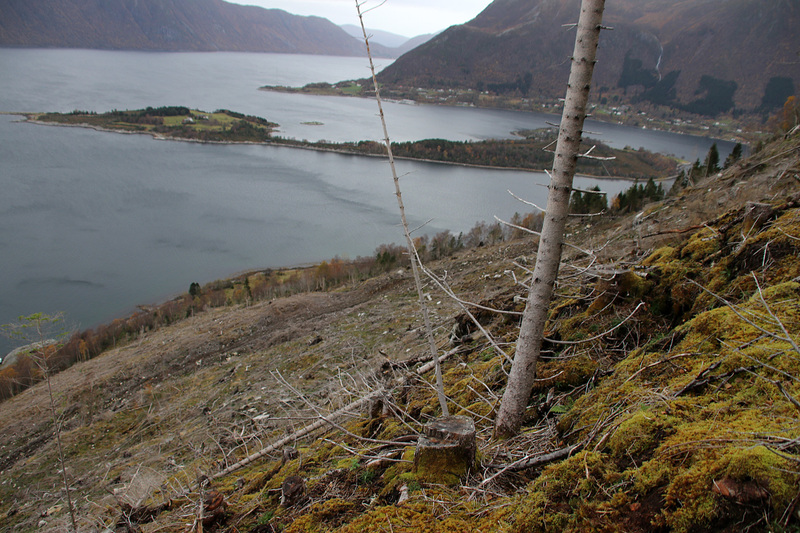 The hike up the forest ridge was mighty nice, and I soon knew that this would be my favorite route to Lidaveten. After crossing Tua, we began the final climb of the 150 remaining vertical meters. It’s always nice to be on top of this mountain! For descent, I decided to head down the Steinnes route, to see if I could find the path through the felled area that I totally missed one week earlier. 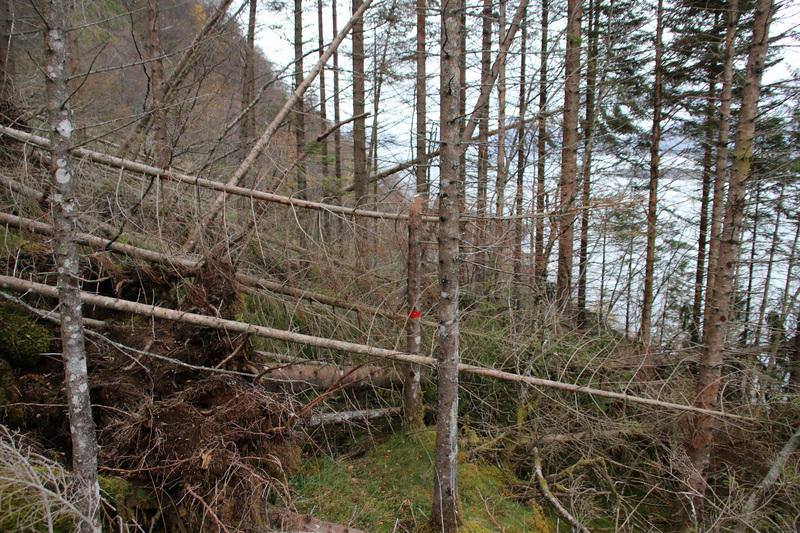 It definitely helped coming from above, opposed to below and I was able to follow the path through the felled area. The definition of an obstacle? 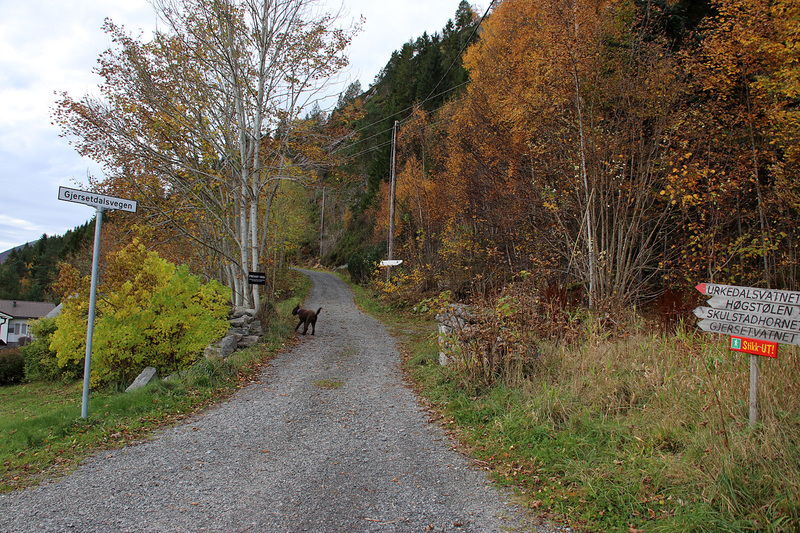 Back on the main road, we had only 1,3km to the car. 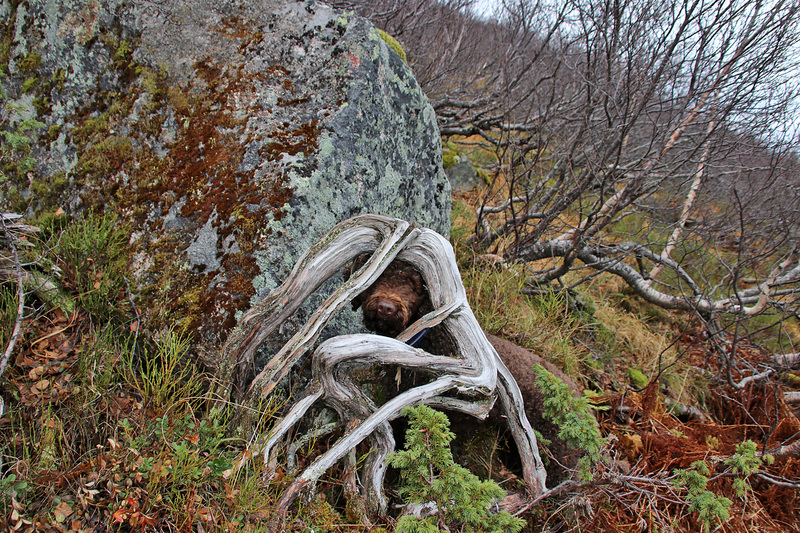 What wonderful hikes. I am blown away by the sheer amount of spectacular sites. 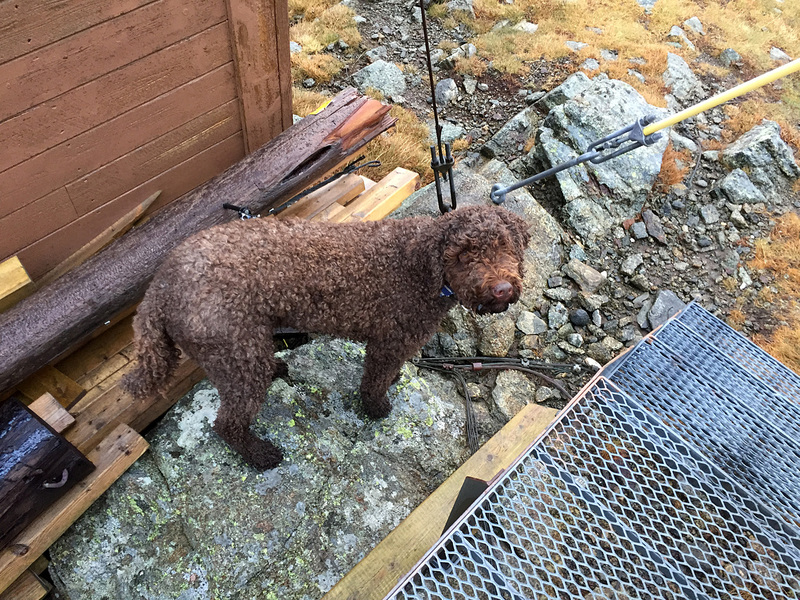 And your trusty hiking partner is very cute. You both must be super fit! Thanks so much for sharing.